The lighter side of life To lighten things up in these dark winter nights we have added LED ‘s to our White Handle-less kitchen. 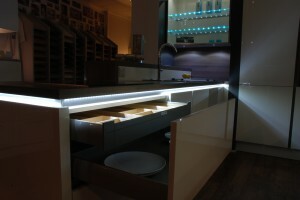 Aside from looking great the LED’s illuminate the contents of the drawers when they are opened. 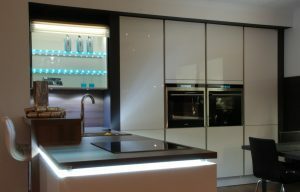 The LED’s are discretely fixed to the underside of the worktop, completely invisible until you turn on the power. Very simple but very effective, two things we really like.